A bony or cartilaginous Y-shaped arch that projects from the posterior side of a vertebral body and encloses the spinal cord. Also called vertebral arch. The posterior projection from the body of a vertebra that encloses the vertebral foramen; it consists of paired pedicles and laminae; the spinous, transverse, and articular processes arise from the arch. In aggregate, the venous arches, and the ligamenta flava that unite them, form the posterior wall of the vertebral (spinal) canal. the curving portion between the ascending and descending aorta, giving rise to the brachiocephalic trunk and, in some species, the left common carotid and the left subclavian artery. paired vessels that run from the ventral to the dorsal aortae through the branchial arches of fishes and amniote embryos. In mammalian development, arches 1 and 2 disappear; 3 joins the common to become the internal carotid artery; 4 becomes the arch of the aorta and joins the aorta and subclavian artery; 5 disappears; 6 forms the pulmonary arteries and, until birth, the ductus arteriosus. one or more arteries that form an anastomotic connection between two more or less parallel tributaries; found commonly around joints and other moveable parts. a large communicating branch between two arteries. four pairs of mesenchymal and later cartilaginous columns in the pharyngeal wall which in fish develop into gills and in mammals become modified into structures of the ear and neck. 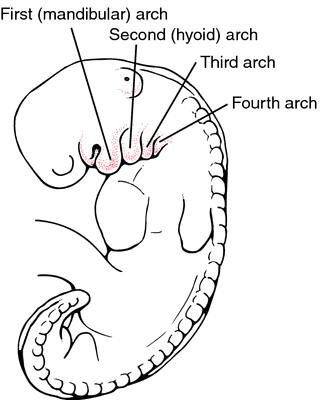 derivatives of the arches are first arch (mandible, ossicles), second arch (hyoid apparatus, ear ossicles), third arch (hyoid apparatus), fourth arch (laryngeal cartilages). the rim to the bony thorax formed by the conjoined asternal ribs and their connecting elastic tissue. the slender ventral half of the cricoid cartilage of the larynx. The most caudal of the palpable landmarks of the larynx. the curving structure formed by the crowns of the teeth in their normal position, or by the residual ridge after loss of the teeth. the v- or y-shaped bone borne on the ventral surface of the tail vertebrae of some animals and which protects blood vessels. Called also chevron bone. the caudal rim of the pelvis formed by the conjunction of the two ischiae. Called also sciatic arch. the dorsal part of the diaphragm where it crosses the ventral surface of the psoas muscles. Here it is without any attachment and only serous membranes separate the thoracic and peritoneal cavities. the first branchial arch, being the rudiment of the maxillary and mandibular regions. the arch formed by the roof of the mouth from the teeth on one side to those on the other. the thick fold of tissue passing from the soft palate to the lateral border of the tongue. a horizontal fold of pharyngeal mucosa that passes from the soft palate and joins with its opposite fold over the entrance to the esophagus. a superficial and a deep vascular arch behind the carpus formed by the conjunction of several arteries of the forearm. the most caudal of the embryonic aortic arches, which become the pulmonary arteries. the deep palmar arch, especially of horses. one of the arterial arches in the foot of carnivores. the superficial palmar arch, especially of horses. a linear arched thickening of fascia that provides attachment for some muscles. the union between the medial and lateral palmar digital arteries, which in horses runs through the solar canal within the distal phalanx. the dorsal bony arch of a vertebra, composed of paired laminae and pedicles. the arch formed by the processes of the zygomatic and temporal bones that is the principal origin of the masseter muscle and is particularly broad and prominent in carnivores. Description: Partial middle caudal vertebra lacking the neural arch (Fig. This middle caudal vertebra only bears a slight anterior displacement of the neural arch more pronounced than in MG 4811 or MG 8805. Description: MG 8799 is the posterior part of a posterior caudal vertebra that preserves part of the neural arch (Fig. It is not possible to determine the relative position of the neural arch and two scenarios, with different implications, can be posed. The neural arch is located in the anterior part of the centrum. 1997) and D'Emic (2012) considered the anterior position of the neural arch in the anterior and middle caudal vertebrae as a diagnostic feature of Titanosauriformes. The broken base of the neural arch reveals some internal camerae. Description: MG 8800 is a partial middle caudal vertebra lacking its neural arch (Fig. The axial neural arch is similar to that of Iguanodon bernissartensis (Norman, 1980) in presenting a dorsally expanded spine, a dorsal edge that is strongly convex, a distally placed apex with an absent posterior concavity, an epipophysis ventral to the apex, and the presence of an accessory bulge on the buttresses between the epipophysis and postzygapophysis. Only the caudal centrum MPZ 2013/369 exhibits a faint suture line with the neural arch along the full length of one lateral side, suggesting that this individual may not have reached full somatic maturity. The Carrol Creek fossil vertebra (12533) is wide through the middorsal neural arch region, has a thick, posteriorly directed hypapophysis, and has a moderately depressed neural arch (in posterior view), as in modern crotaline vertebrae. The neural canal is broad but shallow, and the neural arch is placed posteriorly.